I’ve had a longstanding battle with fried chicken. I have just never been good at making it. I’d burn the crust, or overcook it entirely leaving it dry, or undercook it leaving it, well, raw. It just never was that beautiful, crunchy, juicy fried chicken I oh so dearly wanted to have at my disposal whenever I damn well pleased. Cue the incredibly tiny violins. My understanding was that being born south of the Mason Dixon line afforded me some kind of natural ability to make perfect fried chicken. It apparently does not. I’m in the process of escalating the issue, but I’ve been on hold for a while. So when you are left in the woods to fend for yourself, you are forced to figure it out. You find a source of water. You build a shelter. You determine the best way to fry chicken without burning it. Mainly my issue has been with the breasts. They are just way too big to be manageable. There is one big thick lump on one end that tapers down into a thin filet. How can I be expected to cook a lopsided piece of meat evenly and consistently every time? Anyone who tells me it can be done is full of malarky. The big end might be okay, but the small end ends up as dry as Farrah Fawcett’s face. But seriously, if the chicken is smaller and symmetrical, you are practically guaranteed juicy, perfectly cooked fried chicken every single time. Why take the risk for fear of sacred fried chicken sacrilege? 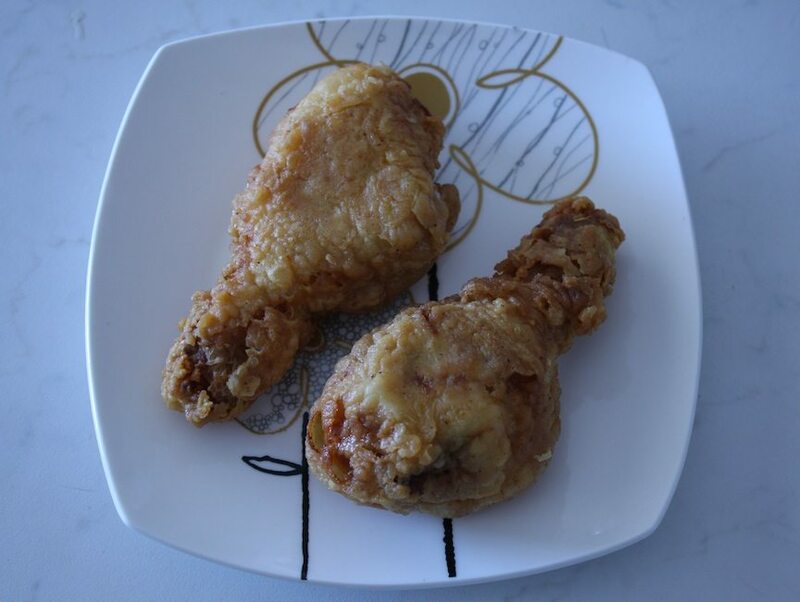 If done correctly, fried chicken can be awesomely delicious and satisfying no matter what shape it comes in. Now for the secret that will put your chicken over the top. Come in closer, I won’t bite. 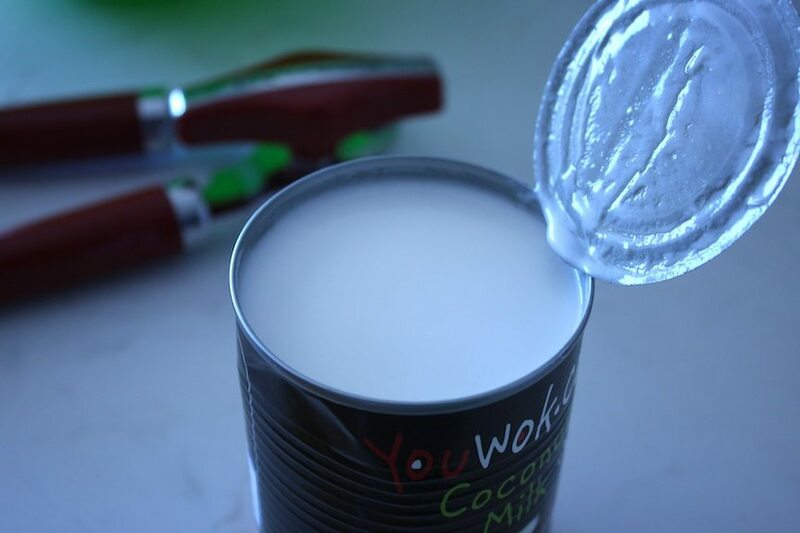 It’s coconut milk. I’ll never use buttermilk as a marinade for my chicken ever again. EVER. As the chicken swims around in spices, garlic and coconut milk, it gets super tender. The chicken also soaks up the mild sweetness from the coconut milk, which makes the meat taste like candy. Fried candy. Buttermilk can’t do that. Did I mention that the crust of this chicken is spicy, and has these big crunchy kernels that you can peel off and munch on in pure unadulterated bliss? Yeah, this chicken has that too. So rise up with me, and challenge the long held notions of what fried chicken should be! And to the southern mothers, you’ll have to cross an ocean to get me. Mwahahaha. Personally, I prefer thighs and drumsticks when it comes to fried chicken. The dark meat is just so damn tasty in this setting. 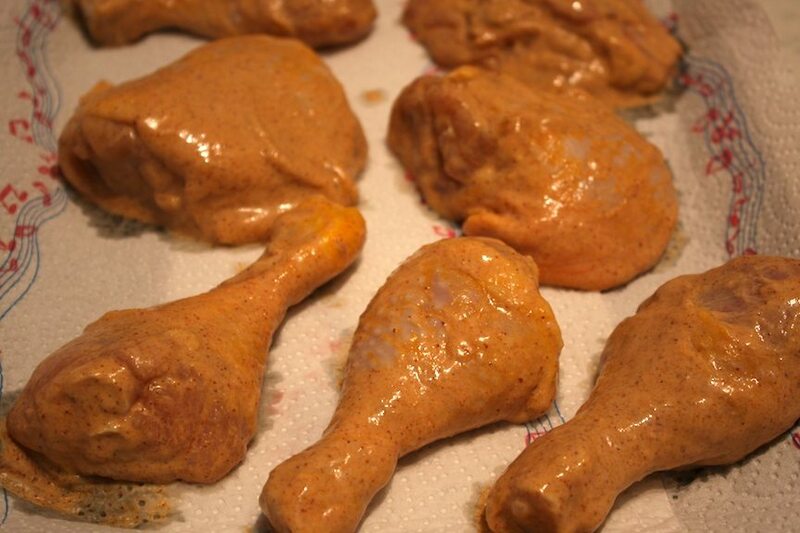 Also, smaller cuts of chicken like drumsticks, thighs and wings are much more manageable to fry with consistency. Breasts can get dried out very quickly because of their size and lack of fat to keep them moist. If you decide to do breasts, I recommend removing the bones and cutting them down into small pieces. You’ll get the same tasty chicken only it won’t be dry as a bone. Trust me. Combine the coconut milk, garlic, spices and salt in a large bowl. Whisk to combine. Drop chicken into a large zip top bag or into glass baking dish, whatever works for you. I’m a fan of the bag for easy cleanup. Pour the marinade over the chicken. Press out air, seal the bag and place it into a bowl or other container just in case the bag leaks. Marinate for 24 hours. For a super coconut-y taste, marinate for 48 hours. Remove chicken from fridge and let is rest for 45m to 1 hour to take the chill off. Rinse the chicken and pat dry. Discard the marinade. Add enough lard or oil to a cast iron or other heavy bottom high-sided pan to come up the sides about 2-3″. For a cast iron skillet, this amounts to approximately 3 c of oil. Heat to 375F. The best frying temp is 350F. However, the temperature of the oil will always drop when you add the chicken. So if you initially heat to 375F, the temperature drop will likely not go too far below 350F keeping you in prime frying range. Fill a paper bag, large bowl or zip top bag with the breading ingredients. Add the chicken, in batches, to the flour to first get a light coat. Then add the chicken to the buttermilk. Remove the chicken from the milk and let the excess drip off. 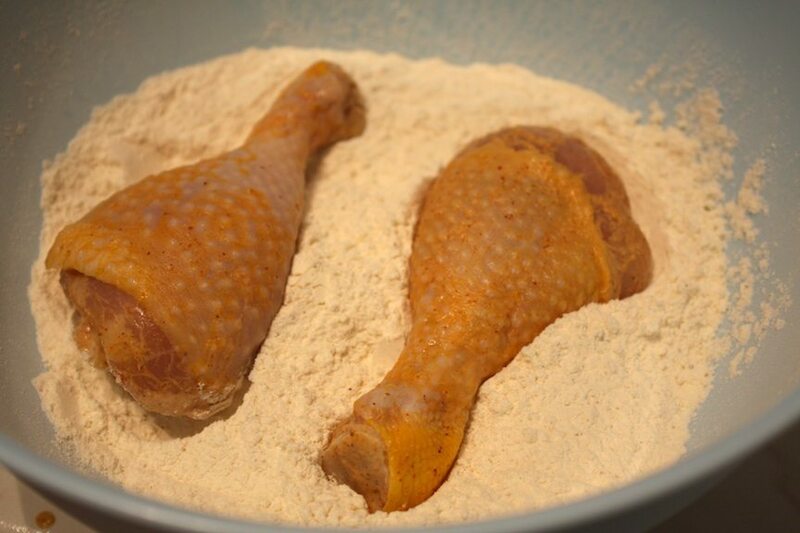 Add the chicken back into the flour for another coating. If you want a super thick crust, go for a third round of this. 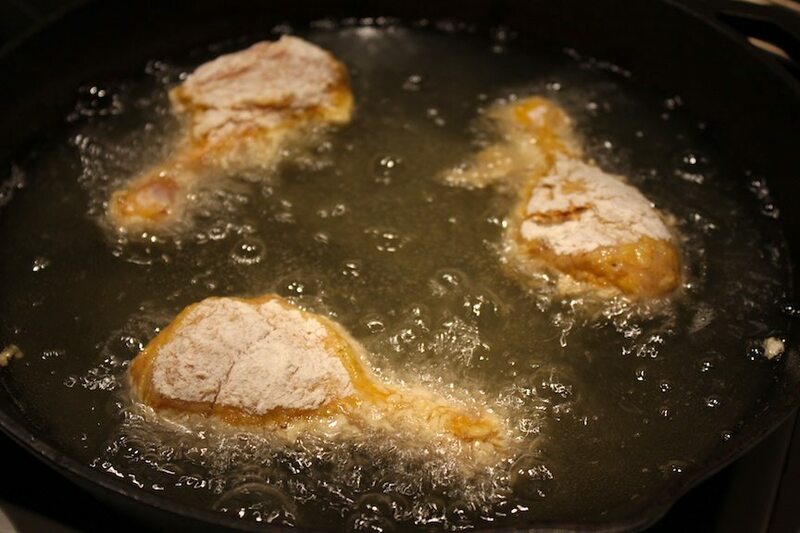 Once the oil has been preheated, place a few pieces of chicken into the hot oil (gently). Chicken should be at least 2-3″ apart. You want space when you’re at the bank, so you’re chicken should be afforded the same courtesy. If the pan is too crowded, the temperature of the oil will drop too quickly and you’ll end up with soggy oily chicken. Keep an eye on the oil temp. If it dips below 320F, let it reheat back up to above 350F before adding more chicken. 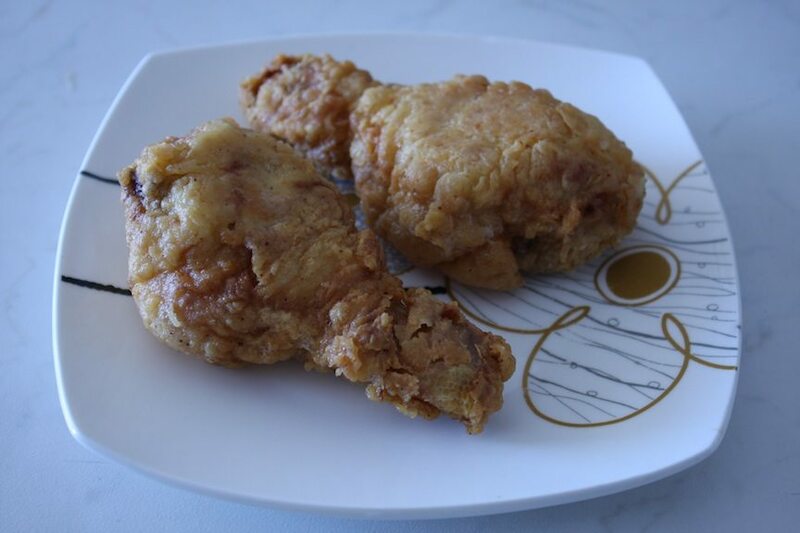 When frying chicken, the best sign your chicken is done is when you see a golden brown crust (given that your oil is consistently around 350F). However, the approximately frying times are below for each cut. For breasts and thighs, cook for 18m total, turning every 4-5m to ensure even cooking and prevent burning. If you cut your breasts into smaller pieces per the above note, you can reduce the cooking time accordingly. If you’re doing butterflied skinless breasts, the total cook time is between 8 and 10m, turning every 2 minutes. For wings and drumsticks, cook for a total of 10m turning every couple of minutes. Hello, have you tried doing this with just chicken tenders, no bone?